Set of 3 Bubblegum iPhone Cases/Covers. Space themed. YES YOU GET 3 CASES: Amazing Value, each case normally sells for £6.99-9.99. I got these cases for my teenage daughter and she really likes them. We chose the space themed pack for her iPhone SE. There are many other designs to choose from too, including a mini animals pack and a junk food pack. The space designs look great on my phone. The cases are clear with planets etc printed on them. I have a gold coloured iPhone, and the colours of the space rockets and planets etc stood out well against this. I particularly like how the Apple logo on the back of my phone has been incorporated into the design and has been turned into a planet - very clever! These cases are very flexible and fit my iPhone SE well. They come with covers that clip over the connector holes. This is a real bonus as it stops dust from getting inside your phone. 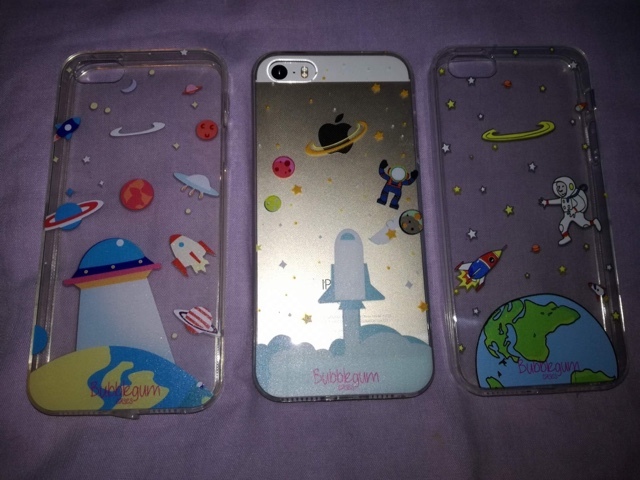 I am very impressed with these space themed phone cases, I definitely recommend them. They are ideal for boys, girls and adults. Five stars.